1 1. Be able to take dictation on new material at 80 words per minute for three consecutive minutes and transcribe accurately the notes taken. 2 2. Have available a shorthand dictionary (usually provided by course publishers). 1. Be able to take dictation on new material at 80 words per minute for three consecutive minutes and transcribe accurately the notes taken. 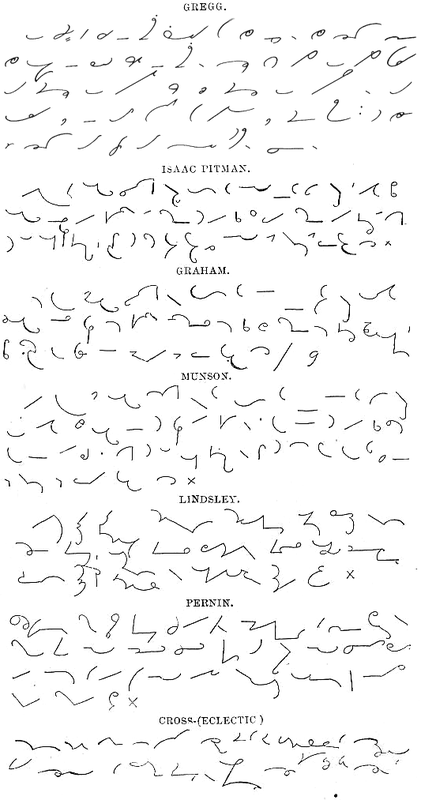 There are many forms of shorthand, but the one most commonly used in the United States is Gregg Shorthand. This section presents the Century Edition. Gregg Shorthand is a phonetic writing system, which means it records the sounds of the speaker, not the English spelling. It uses the f stroke for the f sound in funnel, telephone, and laugh. All silent letters are omitted. The image on the right shows the strokes of Gregg Shorthand Simplified. The sounds are represented in this image by the International Phonetic Alphabet. The system is written from left to right and the letters are joined. Sh (and zh), Ch, and J (or Dzh) are written downward. T and d are written upward. X is expressed by putting a slight backward slant on the s, though the word beginning ex is just written es. W, when in the middle of a word, is notated with a short dash under the next vowel. Q is usually a k with a dash underneath the next vowel. Many of the letters shown are also what are called "brief forms". For instance, "which" is written as ch. These brief forms are shown on the image to the right. There are several others not shown, however. For instance, "please" is written as simply pl, and "govern" as gv. These brief forms can make Gregg Shorthand much faster. Another mechanism for increasing the speed of shorthand is phrasing. Based on the calculation that lifting the pen between words has a speed cost equivalent to one stroke, phrasing is the combination of several smaller distinct forms into one outline, for example "it may be that the" could be written in one outline, "(tm)ab(th)a(th)". "I have not been able" would be written, "avnba" (Note that to the eye of the reader this phrase written in shorthand looks like "I-have-not-been-able", and so phrasing is far more legible than a longhand explanation of the principle may lead one to believe). The vowels in Gregg shorthand are divided into three main groups that very rarely require further notation. The a is a large circle, and can stand for the a in "apple", "father", and "ache". The e is a small circle, and can stand for the e in feed and help, the i in trim and marine, and the obscure vowel in her and learn. The ī represents the i in fine. The o is a small hook that represents the al in talk, the o in cone, jot, and order. The u is a tiny hook that expresses the three vowel sounds heard in the words who, up, and foot. It also expresses a w at the beginning of a word. There are special vowel markings for certain diphthongs (two-sound vowels). The ow in how is just an a circle followed by a u hook. The io in lion is written with a small circle inside a large circle. The ia in piano and repudiate is notated as a large circle with a dot in its center. The u in united is notated with a small circle followed by an u hook above it. Due to the very simple alphabet, Gregg shorthand is very fast in writing. It takes a great deal of practice, however, to master it. Speeds of 280 WPM (where a word is 1.4 syllables) have been reached with this simple system before, and those notes are still legible to anyone else who knows the system. This is the Lord's Prayer written in several forms of shorthand. Gregg's is first (although it is an older version) followed by several others. 2. Have available a shorthand dictionary (usually provided by course publishers). You will need something like The GREGG Shorthand Manual Simplified and a good shorthand dictionary which is easily bought new or used on Amazon. This skill is not that common any more so don't expect to find the books in a regular bookstore. Shorthand was introduced in 1929, discontinued in 1956, and reintroduced in 1986. This page was last modified on 15 March 2015, at 16:16.